On January 22nd, President Trump approved a recommendation made by the United States International Trade Commission (ITC) to impose a tariff on imported solar cells and modules. The tariff is set at 30% for the first year and will decline by 5% per year for three subsequent years. 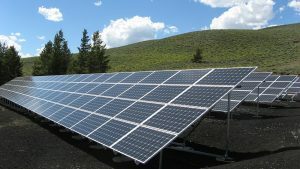 President Trump’s decision came four months after the U.S. ITC found that, according to a rarely used provision of the Trade Act of 1974, Section 201, the competitiveness of two U.S. domestic solar manufacturers – SolarWorld and Suniva – is negatively affected by low-price imported solar cells and panels. Three recommended “remedies” were proposed by U.S. ITC and Trump adopted the middle-of-the-road recommendation. Although the final tariff level is lower than what SolarWorld and Suniva were seeking, it still triggered negative reactions from multiple constituencies. In a statement, the Solar Energy Industry Association (SEIA), which represents businesses across the solar value chain, stated that the tariff may cause the loss of 23,000 solar jobs in 2018 and result in a significant loss in investment. Utilities like Duke Energy and NextEra also spoke out against the trade case as solar becomes a viable and integral part of their business. Trump’s decision to impose the tariff created a chilling effect on the market. According to a GTM Research study, the tariff is likely to increase the cost of solar modules by 10 to 12 cents per watt, which translates to at least an 8.3% decrease in the market adoption of solar. The claimed purpose of the tariff is to protect domestic solar panel manufacturing. However, among the current 260,000 solar jobs, only 38,000 (or 14%) are in manufacturing, which includes not only solar panel manufacturing but also racking systems, inverters, and other balance of system equipment manufacturing. In contrast, the majority of the solar jobs are in installation, which are the types of jobs that cannot be outsourced. While it is unclear if the tariff can revive the manufacturing sector, its negative impact on the domestic solar deployment market would inevitably hurt the solar installation sector. 1) Will utilities continue to invest in solar given the higher panel cost? 2) Will the tariff help domestic solar manufacturers? 3) What can cities and corporations with 100% clean energy/renewable energy goals do to minimize the impact of the tariff on their pathways to meet the commitments? 4) What options do state and federal policymakers have to ensure continuous growth in the renewable energy market? While I do not believe the solar tariff was either good public policy or good economic policy, the impact will be very limited. First, US companies have been bringing in PV modules at the end of last year, likely around 2.6 GW, and we still have some months before the tariff goes into effect this year, so another 1.8 GW, and the first 2.5 GW of imports are not subject to the tariff. So with a 12 GW US market about half of photovoltaics in the first, highest year of the tariff will not cost more to consumers. The US has domestic manufacturers including Sunpower, Tesla, Wanxiang, ITEK, Seraphim and others will increase output for the market, and there are some rumors of some other manufacturers coming on line in Florida and some other States. There still be solar distribution and installer jobs loss in 2018 which will not be compensated for by increases in US manufacturing. The math is that distribution, installation and service create more jobs in solar than does manufacturing. In year 2, when the tariff steps down by 5%, other reductions in mounting hardware, installation efficiencies, balance of system components will also come down which would mitigate the 25% tariff cost increase by half. So will there be some jobs loss, yes, but deployments should be even in 2019. By 2020, the third year of the fourth year tariff, I expect the market to increase due mostly in efficiencies of supply chain and state and local incentives fine tuned to address the tariff increase. Most importantly, the costs of capital for project investment for PPA’s and leases should go down and availability of capital will increase — so that will fuel expansion of the solar market some in 2019 but robustly in 2020. I am bullish that the US solar industry can ride out some bad public policy fundamentally because the industry is scaled-up, costs are coming down further, but most importantly American consumers – homeowners and businesses want solar-generated electricity. I agree there should be no huge effect. Except that it adds to the confusion and uncertainty of where this President stands on energy, business and international trade, and adds to the view that he is a surprisingly terrible deal-maker. Tariffs are generally bad, and very bad in this case since manufacturing is not the core of America’s solar industry. I think that in those states with strong renewable mandates, solar growth will continue as planned as long as the state and federal subsidies continue.